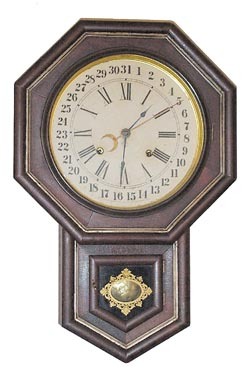 Ansonia Clock Co. hanging, "10 Inch Drop Octagon-Gilt Calendar", ca 1906. Rosewood case is 21 1/2 inches high, has gilt around the top and base, good original tablet, label, dial, and hands. The case has never been cleaned or brass polished, yet is clean and original. 8 day movement with calendar, running, striking a gong. Superb condition for a clock almost 100 years old. Ly-Ansonia No.139.